GoodWorkLabs is the very foundation of how design is perceived and created for the future. When it comes to product design, we are the GOLD standard globally. We convert ideas into world-changing products. GoodWorkLabs is a hub of design leaders, creative thinkers, and product gurus–all working together to ensure one thing–to make your product the No.1 in its category. You might have read thousands of articles on how Blockchain is proposed to bring transformation in the world we live in today. In the next few decades, the possibilities will unfold into opportunities, it’s just a matter of time. Currently, we are just beginning to understand what Blockchain is and how it can be applied for our benefit. If you are a designer, it will be a really tough task for you to design for a concept which is barely understood by its users or potential users. But, an early bird always stands at the favorable side. 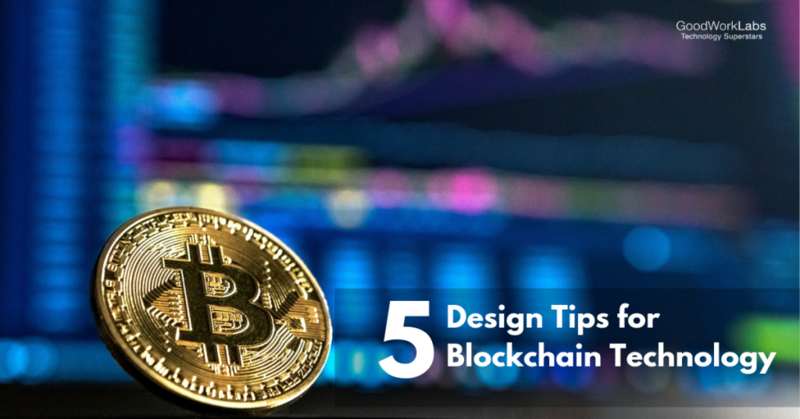 Today, we are laying down 5 simple rules to follow for creating the UX design for Blockchain. After reading this feed, your curiosity about design for Blockchain will get satisfied. Jargons can make any concept difficult for a layman to understand and use. As only a handful of people are involved in using this concept, your focus should be on how to attract more people to use Blockchain and how to benefit from it. Terms which are already floating in the market such as Dapp, DLT, and altcoins make Blockchain overly technical and highly complicated. Also, the Blockchain industry has a bad reputation of being a phony scheme of getting rich quick. To subside all these barriers is not easy and making Blockchain easy is the first step towards design. As a designer, it is your responsibility to make your project more likable and user-friendly. To achieve this, promote ‘no complicated jargons’ approach and focus on the value that can be delivered to the users. In short, unexplained jargons can kill your design. The market is currently segregated in two kinds of people. The minority of them are determined and excited about the Blockchain and majority of them have no idea what it is and feel like outsiders. It is like an impenetrable bubble for them to understand and get excited about the whole Blockchain technology. To penetrate the bubble is like to walk past a Bermuda triangle and not get lost. As a designer, you will face terrible UX and might feel completely blank at several stages. The reason is that this technology has hardly evolved much and there are only a few people available to explain the core concepts and walk you through the process. The key to get through this is to make the Blockchain usable to the layman. Simplify it to the core! Make it so easy that every person with internet access can use it. Here, ‘Coinbase‘ can serve as an example for you. 3. How strong should your security be? People consider security as a major setback of cryptocurrency since all the funds are in a digital wallet, and if stolen, there is no way back and nowhere to complain. There is no authority regulating this. This makes the security of the funds very crucial in order to make the users feel secure and to trust your product. To keep the account secure, you should offer 2-factor authentication (2FA). But, here is the twist. If you mandate the 2FA for all the users there will be a lot of friction at user’s end and then you won’t be able to deliver a seamless experience. To overcome this problem, keep 2FA recommendatory and mandatory for new users. Also, 2FA should be mandated for major fund movements to keep the security tight. This approach will keep the users at peace and deliver the optimum amount of security. In Blockchain, if you deploy something, it usually takes time to process and get finalized. The length of time that it will require is never fixed and it also depends upon how busy the network is. The time taken for completion may range between 5 minutes to 2 hours. In this situation, to deliver an acceptable user experience, don’t keep the users waiting around. Be transparent with them as users like near-instant actions. To manage the user expectations ask them to come back in few minutes and report the current status as accurately as possible. Even better, send them an email update when it’s done. Blockchain has been promoted as the problem solver technology for many industries. Most industries have begun to turn to blockchain technology for solutions now. As a designer, it is important for you to define the problems precisely and design products that can actually solve such real-time problems. Promote the practice of researching and user testing to indeed create valuable products. It is essential to penetrate through the hype and get original user insights. A product designer’s real job title is ‘Problem solver’. As a product designer, you are bestowed upon with authorities and even bigger responsibilities. Blockchain technology may pose some friction in your already smooth design career but it will be a great learning opportunity. Till now, the Blockchain technology has been more focused on the development part. The design on many exchanges and Blockchain websites is still in the latent stage. To make the Blockchain technology usable for the layman, designers should work on simplifying everything. With the effort directed in the right direction, Blockchain will no longer be a mystery but become a part of our daily lives. Are you unsure of doing this on your own? Let us help you! At GoodWorkLabs, we have a team of radical designers who strive to deliver simplified Blockchain solutions. Let’s have a word!